Practical tools & tips that every retiree should know. On my journey I have found that in the end it is not all about the money. Living a happy and worthwhile life is extremely important. Read how I have navigated through the retirement maze and found my way after being left a widow. Learn from experts to help you prepare well for a happy retirement. How to save yourself from a depressing retirement. The “3 R’s”. What will you do with your empty nest? Which experts you need on your team to help you look after your nest egg. Investing tips from leading experts. How long will the money last? 5 Important questions you need to ask when planning for retirement. Why supplementing your retirement income online is gaining popularity. 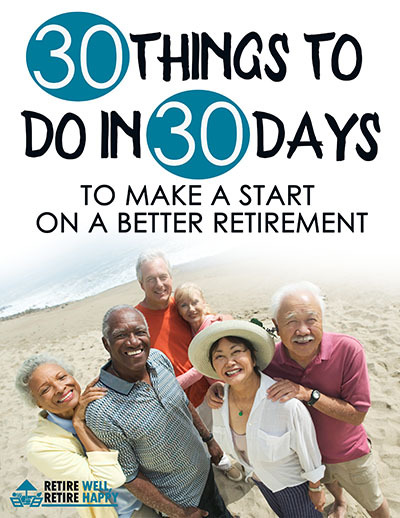 Now theres a book that makes it easy to understand how to do just that – Retire Well, Retire Happy. AND For this first time there is one book that not only gives you the fast track tips on how to put a plan in place, but also gives you the hints and tips from experts in the field, about how to best plan for – and make your retirement work for you. 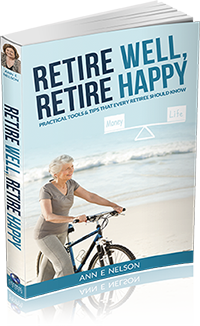 Written by Author, Speaker and retirement coach – Ann Nelson, Retire Well Retire Happy, will give the roadmap to a successful and fulfilling retirement. Please enjoy this website, buy the book, and check out our free online resources. PLUS drop us a line in our blog and let us know how your thoughts on retiring well and happy. The more we share, the better the journey for all.